The Democratic race has become far more interesting than many expected, but we are seeing variations of the same stories the last few weeks: Clinton’s support falling, including in Iowa, New Hampshire, and among women, and along with continued questions about whether Joe Biden will run as the Democratic establishment gets more nervous about Clinton as a candidate. In the Democratic contest, Clinton’s drop is dramatic, yet not enough to threaten her clear lead. She’s supported by 42 percent of Democrats and Democratic-leaning independents who are registered to vote, down from 63 percent in July, while Sanders has gained 10 points, to 24 percent, and Joe Biden’s up by 9 points, to 21 percent. If Biden doesn’t run, most of his support moves to Clinton, boosting her to 56 percent – exactly double Sanders’ support in this case. Even if still in a strong position, Clinton’s trajectory leaves no question that she has trouble. Just 39 percent now see her as honest and trustworthy, matching her career low; that has dropped by 14 points since last summer. At 46 percent, her rating for empathy –- understanding the problems of average Americans -– is at a career low (albeit by a single point). Her support in the primary has tanked in particular among women, previously a mainstay of her candidacy, from 71 percent in July to 42 percent now. In the Democratic contest, Clinton and Sanders run essentially evenly among whites, 31 vs. 33 percent; Clinton’s lead relies on nonwhites, among whom she has 57 percent support, to Sanders’ 13 percent. It’s the only major demographic group in which Clinton still maintains a clear majority. Clinton’s support from nonwhites has dropped, by 14 points, from 71 percent in July. But her support from whites has fallen farther, by 25 points, in the same time. 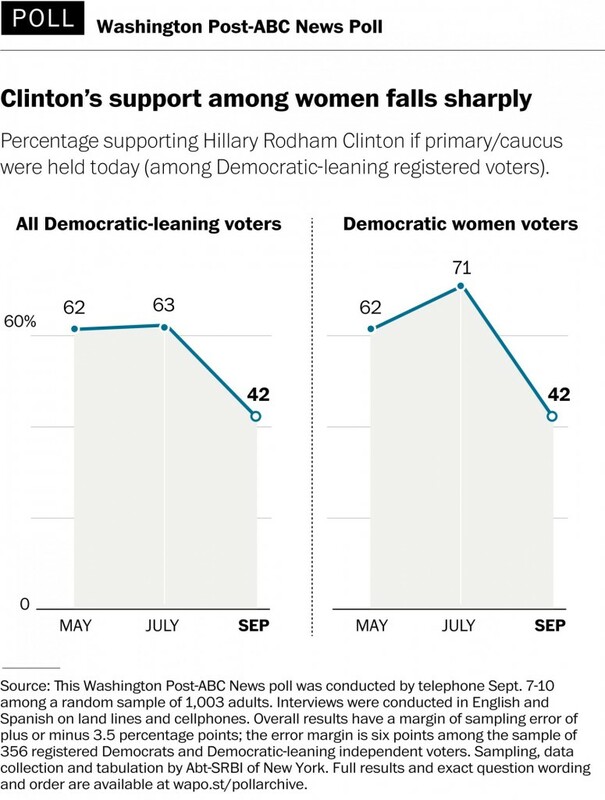 As noted, too, Clinton’s support among women has cratered by 29 points since July. Among men she’s lost 9 points in the same period, from 52 to 43 percent. Her gender gap has evaporated. The new poll finds Sen. Sanders with 52% support among Democratic primary voters in New Hampshire, while former Secretary of State Clinton, long considered the front-runner for the 2016 Democratic nomination, receives 30%. Recent polls have shown Sanders’ lead growing in the Granite State, but this would be the first to show the Vermont Senator over 50%. Possibly more worrying for the Clinton campaign is her performance in Iowa, where Sanders now leads by 10 points, with 43% to Clinton’s 33%. There is also some news of interest which is somewhat related to the Republican race. Arnold Schwarzenegger has been named the new host of Celebrity Apprentice, replacing Donald Trump. Trump is being replaced due to running for president, along with alienating NBC and many potential viewers with his xenophobic talk. Schwarzenegger very well might have been a contender for the Republican nomination (either now or in the past) if not disqualified due to not being a natural born American citizen. Plus, ironically in light of the xenophobia he is spreading, Donald Trump is losing his job to a foreigner.